Professor Kate Warner AC and Dr Duncan Chappell, for a lifetime of outstanding, significant and sustained contributions to Australian and New Zealand criminology. Dr Bianca Fileborn, LaTrobe University for her article Doing gender, doing safety? Young adults’ production of safety on a night out published in Gender, Place and Culture, A Journal of Feminist Geography. Lorena Rivas, Griffith University for her paper Contemporary Perspectives on Crime: Antiquities Trafficking, supported by Professor Susanne Karstedt. Associate Professor Julia Quilter, University of Wollongong for her article Populism and criminal justice policy: An Australian case study of non-punitive responses to alcohol-related violence, published in the Australian and New Zealand Journal of Criminology. Dr Garner Clancey, Sydney University for his article, Some findings from an Australian local crime prevention case study, published in Crime Prevention and Community Safety: An International Journal. Shelley Eder, Charles Darwin University. Marita Leask for her paper titled ‘A critical discourse analysis of New Zealand sentencing decisions in cases where women kill in the context of intimate partner abuse’. Madeleine Ulbrick for her paper (with A. Flynn and D. Tyson) titled ‘Abolishing Defensive Homicide: A Step Towards Populist Punitivism at the Expense of Mentally Impaired Offenders’. The PhD candidate is first and corresponding author. Patricia Aloi for her paper Victim Impact Statements in Superior Court Sentencing Proceedings in Western Australia. Eileen Baldry and Chris Cunneen for their article Imprisoned Indigenous women and the shadow of colonial patriarchy, published in volume 47(2), pp 276-298 of the Australian and New Zealand Society of Criminology. Tim Prenzlar for his edited book Professional Practice in Crime Prevention and Security Management. 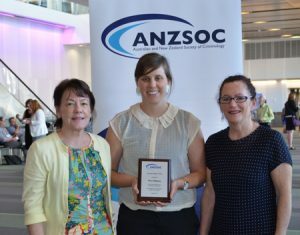 Kathleen Daly and Janet Chan, for outstanding significant and sustained contribution to Australian or New Zealand criminology. Samarah Symons for her paper Independent Legal Representation for Victims of Sexual Assault: Consideration of a Proposed Amendment to the Victims of Crime ACT 2001 (SA) under supervision of David Plater. Michael Salter for his paper Justice and revenge in online counter-publics: Emerging responses to sexual violence in the age of social media, published in the Crime, Media, Culture, an international journal. Wayne Goodall and Russil Durrant, for their article Regional Variation in Sentencing: the incarceration of aggravated drink drivers in the New Zealand District Courts, published in volume 46(3), pp 422-447 of the Australian and New Zealand Journal of Criminology. Christine Alder and David Biles, for outstanding significant and sustained contribution to Australian or New Zealand criminology. Alexa Ridgway (pictured below) for her paper ‘Talking Trauma’ under supervision of Kathleen Daly. Dr Asher Flynn and Dr Kate Fitz-Gibbon (pictured below) for their paper ‘Bargaining with Defensive Homicide: Examining Victoria’s Secretive Plea Bargaining System Post-Law Reform’, published in the Melbourne University Law Review. Tracey Booth,‘‘Cooling out’ victims of crime: Managing victim participation in the sentencing process in a superior sentencing court,’ Australian and New Zealand Journal of Criminology, August 2012; vol. 45, 2: pp. 214-230. 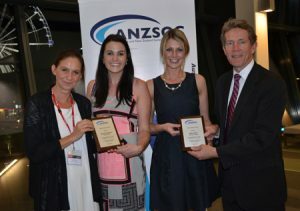 Richard Harding, for outstanding significant and sustained contribution to Australian or New Zealand criminology. Vincent O’Kane for his paper “Indian approaches towards controlling opiate production and their relationship to international drug control” under supervision of Steve James. Dr Meredith Rossner for her paper “Emotions and Interaction Ritual: A Micro Analysis of Restorative Justice”, published in the British Journal of Criminology. Kerry Carrington, Russell Hogg, and Alison McIntosh, “The resource boom’s underbelly: Criminological impacts of mining development” Australian and New Zealand Journal of Criminology, December 2011; vol. 44, 3: pp. 335-354. John Braithwaite, for outstanding significant and sustained contribution to Australian or New Zealand criminology.